Take a quick look at the table to understand the requirements for each of the methods. Do devices require an MDM to be installed in it? Is app support necessary for the implementation? Do devices require additional restrictions during setup? How to Exit from the mode? These methods are quite simple, yet it can be challenging to narrow them down to your requirements.Here is a brief description of each of the assessment methods. Single app mode(SAM) is a feature that locks devices to a single app and let users focus their devices to perform some specific task. The selected app automatically launches itself and runs in the foreground. IOS devices must be supervised. Devices must be enrolled in an MDM(Enroll with Hexnode MDM). Devices should be connected to a Wi-fi network. The app you wish to launch must be installed in the devices. Apple Configurator is an application developed by Apple Inc. that enables administrators of business and educational organizations to configure profiles and settings on iPads and iPhones by using a USB connection. To enable and disable single app mode using configurator the devices have to be physically connected to the Mac .This makes it a poor choice for devices in different locations. MDM Software allows administrators to enable Single app mode over the air across multiple devices simultaneously. Administrators can enable single app mode remotely at the beginning of the assessment and disable it after the assessment has completed. Suppose that the iPad battery drains completely and the device shuts down. When rebooted, a device that ran in single app mode will re-launch the app and continue running in the same mode. Log in to your Hexnode MDM Console. Navigate to Policies and click on New Policy. Name the new policy and give a brief description for the same. Go to Kiosk Settings under iOS Settings (for Supervised iOS Devices only) ,Select Single App Kiosk and click on Configure. Click on + icon and select the app from the list. Hexnode MDM allows you to enforce additional restrictions (for iOS 7+) from Advanced Kiosk Settings. Click on Policy Targets > +Add Devices. Add all the devices you wish to associate the new kiosk policy to. Click on Save. Perform steps 1-5 and click on Save. Navigate to Policies. Select your new kiosk policy. Click on Manage > Associate Targets. Select either one of the options mentioned below to associate the policy to. Once you have completed the steps, your device(s) will enter the single app mode. You can disable kiosk in 2 ways. Let’s take a look at how Hexnode MDM makes this work easy for you. Hexnode MDM supports several methods to exit from a kiosk. Click on Management > Devices. Select the device you wish to dissociate the policy. Click on Manage > Disable Kiosk Mode. Click on Policies. Delete your kiosk policy from the list by clicking on the trash icon. Click on Policies. Select your kiosk policy. Click on Manage > Delete. This method is ideal if your device isn’t connected to any networks. Connect your device with Mac that has Apple Configurator installed in it. Open Apple Configurator where you will see your iOS device. Right Click on the device, select Remove option and click on profiles . Choose the profile ‘Hexnode MDM’ and click Remove Profiles. When the confirmation box pops up, click on Remove. Ensure that your device is connected to a network. No changes can be made from the MDM Console if your device isn’t connected to a network. Your device will become faulty if the app associated with your kiosk policy isn’t already installed in your device. This will require the kiosk policy to be dissociated from your device. Only one kiosk profile can be associated with your device at a time. Autonomous Single App mode allows an app to lock itself into Single App Mode and release itself from this mode. The device will be locked down to the app when the user signs into the app and released only when the user signs out of the app. No other features are available for user access. Since the session is started and stopped locally on the device, it does not necessarily require an internet connection. The app must be whitelisted with MDM. Log into your Hexnode MDM Console. Navigate to Policies > New Policy. Go to Kiosk Settings under iOS Settings (for Supervised iOS devices only), select Autonomous Single App Mode and click on Configure. Click on + icon and select the app from the list. Click on Policy Targets > +Add Devices. Add all the devices you wish to associate the new kiosk policy to. Once you have completed the steps, your device(s) will enter the Autonomous Single App Mode. Guided Access Mode is an accessibility feature that enables a user to manually limit a device to a single app. It restricts users from switching between apps, accidentally exiting the app or returning to the home screens. You can hand over your device without having to worry about another user prying on your personal information. This accessibility feature proves to be useful in different realms such as education, businesses, research, restaurants etc. Turn on Guided Access by toggling the slider. Tap on Passcode Settings > Tap on Set Guided Access Passcode to set a passcode to exit the session. Launch the app you wish to use. Tap the home button 3 times. This will open a Guided Access Menu. Click on areas on the screen that you would like to make inaccessible. Tap on the options button in bottom left corner to permit access to various features. Click on start to begin the guided access session. There are two methods to end your guided access session. Go to Settings > General > Accessibility > Guided Access > Passcode Settings >Turn on Touch Id. To end a session, Tap Home button once and then use your touch id. Click on the home button thrice and then enter the Guided Access Passcode. If the user tries to exit the session, a message is displayed to the user informing him to tap the home button three times to exit. If you forget your guided access passcode, wait for the device battery to drain completely. Once you reboot the device after connecting to power, you’ll be redirected to your home screen. Guided Access requires each device to be configured manually. Also, it does not provide support for restrictions such as Spell-Check, Auto-Correction, Dictionary-Lookup etc. Hence, it is not recommended for summative assessments. 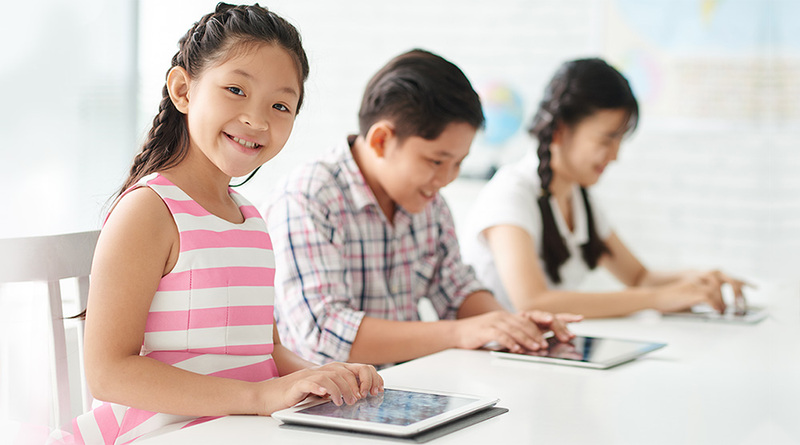 Automatic Assessment Configuration(AAC) enables apps to automatically lock and configure iPads. It enables assessment developers to build apps that will lock an iPad to single app and invoke restrictions once the user logs in. Suppose that you wish to give students a test. You have to restrict students from changing device settings, switching between apps and from using built-in features like Dictionary Definition Lookup, Auto Correct, Spell Checker, Sharing, Predictive Keyboard etc. This requires the iPad to be locked down to a single assessment app. Automatic Assessment Configuration is one of the favored methods for executing assessments on iPad as it does not require any manual interference in configuration or management. No need to whitelist apps. It is advised to ensure that your assessment app provides support for Automatic Assessment Configuration. A Configuration profile is an xml file that enables users to set restrictions for devices. A configuration profile contains settings for wi-fi, Web Clip, email, LDAP, VPN. If you have a large number of devices to deploy, creating a configurator profile would be an ideal option.